Recorded on January 19, 2014. The untold true story of Brian Epstein, the visionary manager who discovered and guided The Beatles from their gigs in a tiny cellar in Liverpool to unprecedented international stardom. 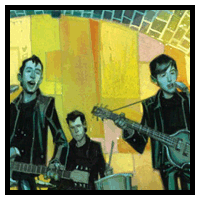 The Fifth Beatle is an uplifting, tragic, and ultimately inspirational human story about the struggle to overcome seemingly insurmountable odds. Man, THE SPIRIT is such a weird movie. I had a lot of hope for it because clearly Miller loves Eisner & The Spirit in particular, but it is really uneven & a mess. It feels like they shot half the movie & changed creative teams without watching the first half. Solomon Kane I remember being pretty good. We will see what you think.